Mary Carew-Miller, left, and Kayleigh Hendy in a scence from their film, "The World I Want to Live In." Lydia Hagen, Roxanne Edel, Sierra Wilson, Breanne Pitt and Kayleigh Hendy with acclaimed actor Alfre Woodard. The young filmmakers and their teacher pose with Millie Bobby Brown from the Netflix series, Stranger Things. And they were the only middle school students to receive this honor. The theme of this year's festival was "The World I Want to Live in." The eighth graders from Shepaug Valley School decided to make a newscast from the future with the same name. Each story is a news brief that highlights a present issue that's been solved in the future. For instance, Mary Carew-Miller played a newscaster interrupted with breaking news. "Chief Justice Anne Parker has just informed us that today marks the 13th consecutive year that New York City has been free of violent crime," she said, acting under the name Adeline Smith. The filmmakers' school is in the quiet rural town of Washington, Connecticut. During a visit there with WNPR in late September, the student crew quickly made one thing clear: they had a lot of fun making the video. "I think the best part was when we misworded things," said Sierra Wilson, who plays a Republican candidate for president in the film. "Because we misworded things so many times, and it was so funny, because like you'd want to say like, air, and someone would say, hair, and they wouldn't realize it and they'd keep going and we'd all be laughing and they'd just be looking at us really weirdly and we'd have to re-shoot everything." But making mistakes is part of the process, said teacher Breanne Pitt. The film couldn't be longer than three minutes. Pitt said her students learned how to use precise and concise language to get their message across in such a short time frame. And she let them figure it out on their own. 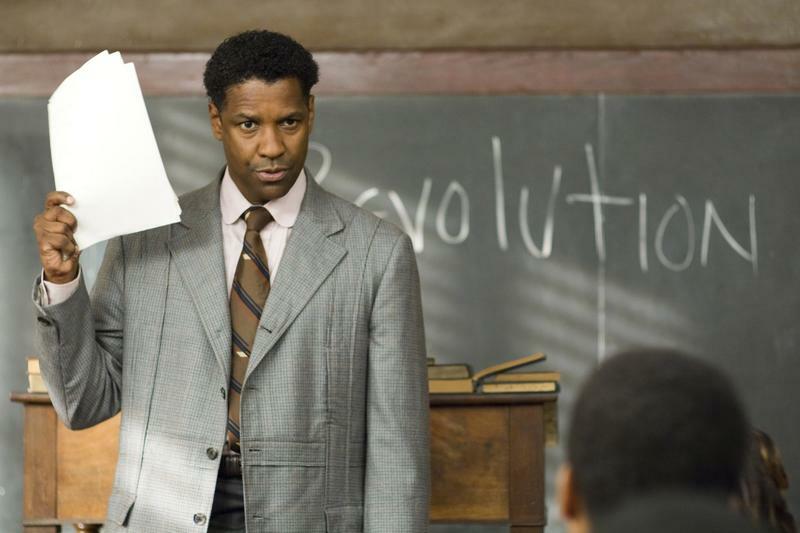 "This was mostly them," Pitt said, adding that it was "very student-directed." She only helped with a few technical things -- and the occasional reining in. "You know, they have a lot of energy," she said, "and they focused that energy in a very positive way." 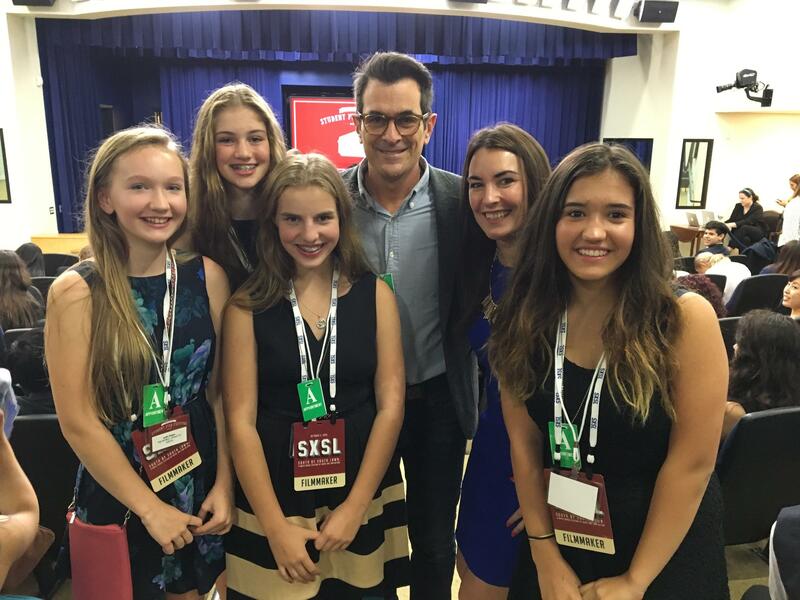 Lydia Hagen, Roxanne Edel, Sierra Wilson, Breanne Pitt and Kayleigh Hendy with Ty Burrell from the TV show "Modern Family." In the film, they talk about air pollution, bees and pollination, renewable energy, crime, political cooperation, and even education. They chose to leave out some of the more controversial topics said Roxanne Edel, 12, who played a meteorologist named Sage Baker. "We didn't want to be biased about it and say, 'Oh this is bad.' We couldn't say that it's bad because some people don't think it's bad," she said. They also tried to allude to certain issues instead of tackling them head-on. For example, instead of talking about obesity directly, they talked about how in the future, most people run or bike to work. Lydia Hagen and Eliza Slastushinskaya also helped bring the film together, each as field reporters. They're all members of a film club, and this is the second short film they've made. By now, they realize that making a video isn't as glamorous as it might seem. "I feel like there were five or so hours of footage taken," said eighth grader Jaxen Griggs, who was the cameraman. "We had to do so many retakes and their legs started to go numb because they had to be kneeling down for it to be in the perfect shot." This isn't the last movie for this group of young cinephiles. Kayleigh Hendy, who plays one of the news anchors, had the idea to make a comedy about a support group for moms who have silly problems, like being addicted to flowers, or being obsessed with teen culture. White House officials noted that nearly all of the videos submitted had one thing in common -- none of them talked about a future full of flying cars or other gadgets. As pointed out on the festival's website, this generation of youth seems to be "inspired by something much more simple: the dream of a more tolerant, more fair, more environmentally friendly world." This story was co-reported by students at the Journalism and Media Academy magnet school/CPBN Learning Lab satellite campus. A group of students at East Haven High School created a short documentary, “Weaving the Way: Lessons From the Weaver Bird.” The film recently won outstanding documentary short at the Connecticut Student Film Festival. Experts agree that climate change is a global problem. A documentary film company in our region planned to look at how Adirondack communities are adapting to climate change. But the film’s producer changed his focus after encountering high school students at a Youth Climate Summit.